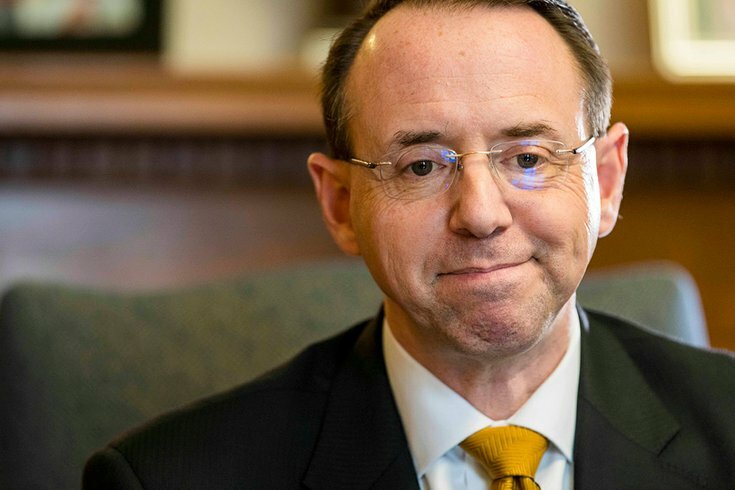 Rod Rosenstein, deputy attorney general for the U.S. Justice Department, answers questions during a March 12, 2018 interview. Speculation was heating up Friday at it's only a matter of time until Rosenstein is fired by President Trump. The chatter ramped up Friday that it's only a matter of time until Trump fires Rod Rosenstein, the deputy attorney general for the Justice Department. Rosenstein, of course, is the Philadelphia native and Penn graduate who appointed (and now oversees) special counsel Robert Mueller to investigate ties between Trump's campaign and Russia during the 2016 election. As that investigation heats up – Trump attorney Michael Cohen's law office and home was raided by the FBI earlier this week – so has speculation that Trump will fire Rosenstein, who would be the top official at Justice with authority to fire Mueller. But Rosenstein has made it clear he will not fire Mueller without legitimate cause. Meanwhile, Democrats and a number of Republicans in Congress have warned the White House not to dismiss Rosenstein or Mueller. Such a move can be guaranteed to spark nearly immediate protest in Philadelphia and across the nation. On Friday, U.S. Rep. Brendan Boyle, a Democrat from Northeast Philadelphia, indicated a Rosenstein firing would trigger an immediate article of impeachment in the House. He could expect to have many supporters. Meanwhile, a coalition of activists, unions and policy organizations, including MoveOn.org, has a rapid response plan in place at the first sign of a pink slip (or Trump tweet?) for Mueller or Rosenstein. Some 800 protests have been scheduled nationwide. More than 300,000 people have RSVPed for one of the potential protests. For addresses and more information about the protests, go here.